Milan, Italy is a jewel of a city best known as a hub for fashion and culture, but in December the town comes alive with celebratory festivals, street fairs, and holiday events starting early in the month. 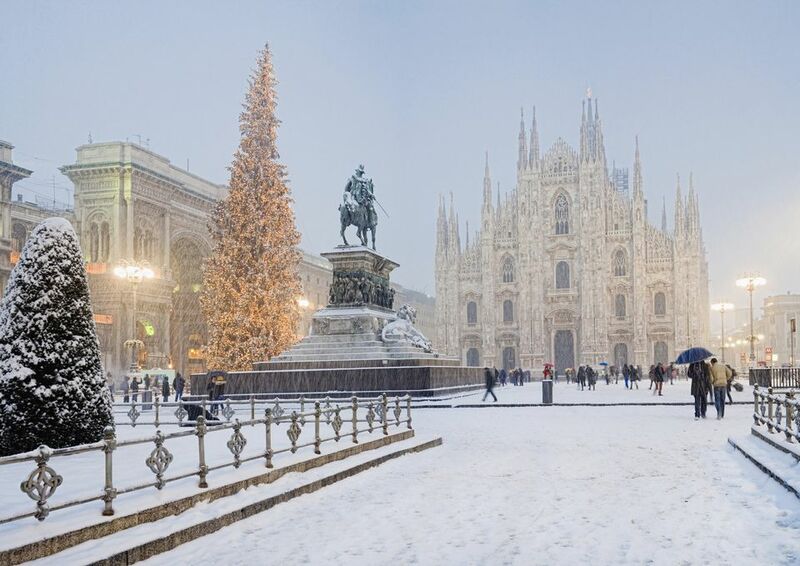 For travelers prepared for cold weather (and perhaps even snow), Milan is a beautiful escape to enjoy the sounds and sights of the season. Hanukkah: Hanukkah in Milan is celebrated at various synagogues throughout the city over 8 nights from December 2, 2018, to December 10, 2018. There is a spectacular large public Menorah traditionally set up in Piazza San Carlo. La Scala Theater: While not exclusive to the December month, the holiday season is an especially great time to take in a concert at the beautiful La Scala Theater, one of Italy's top historic opera houses. The decorations along the streets and festive atmosphere lend a unique flair to a night out of culture. O Bej! O Bej! This street market festival is one of the most popular festivals of the year in Milan and runs December 7, 2018, to December 10, 2018. Coinciding with the feast day of Sant'Ambrogio, the patron saint of Milan, O Bej! O Bej! features food, wine, and craft vendors around Piazza Sant'Ambrogio. Special church services are also held in the Duomo (Cathedral) for this occasion. Holiday for the Immaculate Conception: On this day, the Catholic faithful celebrate the day of the Virgin Mary's conception of Jesus. December 8th is a national holiday, so many businesses may be closed in observance, but most tourist services should be open. Christmas Markets in Milan: From December until early January, a Christmas fair near the Duomo is where Milanese and visitors go to buy Italian-made nativity crafts, children's toys, and seasonal treats. There is also a popular Christmas craft fair called L'Artigiano in Fiera, held at the Fiera complex in Rho. Christmas Day: You can expect everything to be closed on Christmas Day as the Milanese celebrate the most important religious holiday of the year. Of course, there are many ways to celebrate Christmas in Milan, from attending midnight mass at the Duomo to visiting Christmas crèches and nativity scenes around the city, usually on display through January 6th. It's a good idea to make a reservation for lunch or dinner on Christmas day as many establishments may be closed for the holiday. Saint Stephen's Day: December 26th is a public holiday, and is considered an extension of Christmas day. Families venture out to view nativity scenes in churches and visit Christmas markets. The feast day of Santo Stefano is also held on this day and especially celebrated at churches that venerate Saint Stephen. New Year's Eve (Festa di San Silvestro): Just as it is all over the world, December 31st, which coincides with the Feast of Saint Sylvester (San Silvestro), is celebrated with much fanfare in Milan. If you want to go to a special dinner or party, be sure to book in advance.